The Sugar Land City Council’s recently passed RESOLUTION No. 14-21 seeks to impose vehicle registration denial for unpaid red light camera fines. This is only an agreement between the city and the state. It does not pertain to county tax offices where vehicle registrations will continue to be renewed and transferred regardless of red light camera fine nonpayment. The resolution does nothing to change this in-person ability to renew or change vehicle registrations. The threat of employing a collection agency to pursue fine payment is not likely to be cost effective and it is illegal to notify any credit bureau that a red light camera fine is unpaid. The red light camera fine continues to be voluntary. We call upon all vehicle owners who have received a red light camera ticket to REFUSE to pay the fine. Together our civil disobedience will show that the overzealous enforcement of the red light law must stop. Sugar Land citizens must be allowed to vote on the future of the red light camera program. 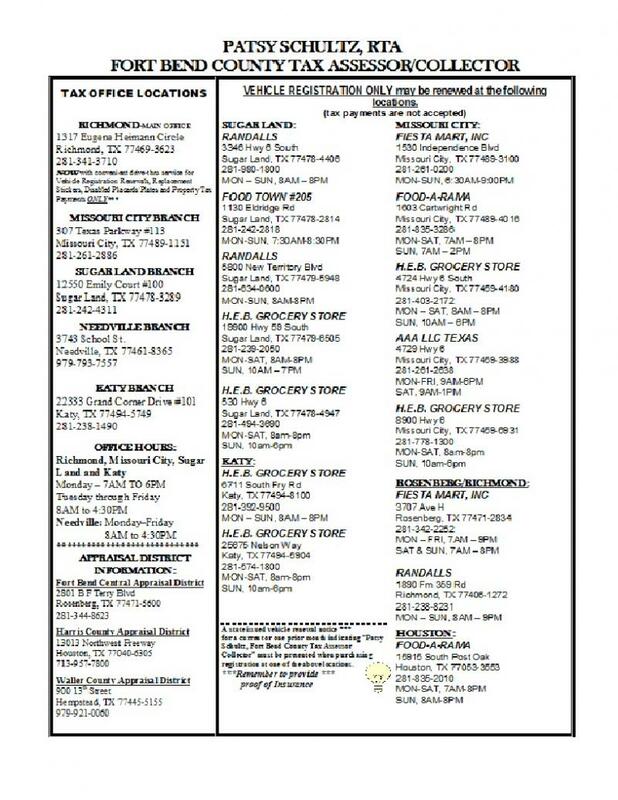 The following table lists 20 locations in Fort Bend County where vehicle registrations may be renewed.